About - FitzGerald Life & Pensions Ltd.
FitzGerald Life & Pensions Ltd. are Financial Advisors, regulated as Authorised Advisers by the Central Bank of Ireland. We provide broad based professional and impartial advice in relation to Life & Illness Protection, Pension Planning, Regular Savings, Deposits & Investments. 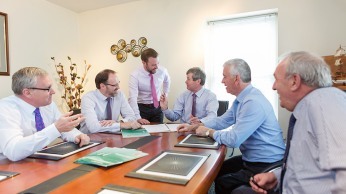 Based in Waterford City, Fitzgerald Life & Pensions Ltd., is a locally owned company with a national profile with customers from Waterford to Donegal, from Dublin to Kerry. Whether you require advice on existing or new pension plan, individual or group pensions we can meet your requirements, in a relaxed friendly atmosphere. Successful Financial Planning is all about making the right choices in relation to your pension or investment. Our aim is to provide you with the necessary information to make the choices that suit you, your family or your business needs in the long term.